I’ve heard about the ability of a cockroach to live for a time without its head, due to having ganglia in other parts of its body. Basically, it will die from starvation or infection. But… I had not heard of a cockroach living without its entire abdomen. And then I witnessed it myself. I have a pet vinegaroon (whipscorpion) named Stanley. I caught him in Arizona two years ago as a youngster, and he’s a nice young adult size now. I periodically feed him small hissing cockroaches from the colony raised for introductory biology classes. They end up with so many roaches they encourage me to take them. I put one into the cage today, and the hisser crawled into Stanley’s burrow. A while later, I saw the cockroach scurrying around, and climbing up the glass. Something seemed… off… so I took another look, and realized its entire abdomen was gone. Stanley had eaten it, and the front half ran away. Any guesses on how long the poor thing will live? I don’t know the exact point at which it escape from Stanley’s clutches, but I’d guess about 12 noon EST. EDIT (Feb 1, 9:00am): 21 hours later, the cockroach is still alive! 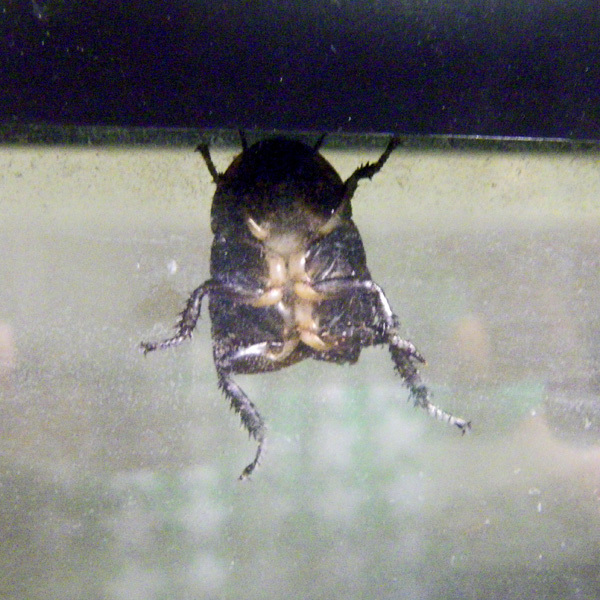 EDIT (Feb 3): I did not visit the lab over the weekend, however I know it lived at least 30 hours without its abdomen. It likely died of dessication.